All glass items featured on this site are made by me, Tatia Johnson of Memphis, TN. The photo on the left is my beadmaking demonstration at a craft show using my portable hot head torch. I have always been a creative person and became intrigued by glass beadmaking when I bought a kit at the local gem and mineral show back in 1993. I am self taught and started out making enamel glass beads using copper tubing as a base and layering enamel frit (granulated glass) onto it with a hand held propane torch. Those first beads were very primitive, but they got me hooked on beadmaking. I have since upgraded my studio and booth displays significantly. Perhaps someday I will learn to blow glass. 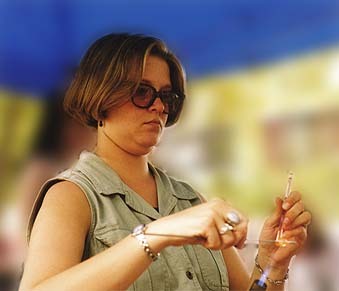 I am addicted to lampworking and prefer to spend as much time as possible in my studio, but I spend a large part of the Spring and Fall seasons at various shows and festival throughout the Southeastern United States. In a previous life I was a theatre major and spent many hours upon the stage. 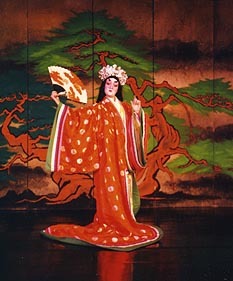 The photo on the right is me in a Kabuki-style production of Medea under the direction of Kabuki Master Shozo Sato. I played the young, beautiful, and spoiled Princess of Kyushu (the woman Medea was spurned for and who never appeared onstage in the original script.) Although not truly evil, she was villanous and corrupt. This character was a lot of fun to play. She had a great flaming "death dance" and the back of her large (and very heavy) kimono opened up to reveal yards and yards of intricately sewn silk and cloth.